“Dr. Norris rocks! Every time I have an appointment I am treated with uber satisfactory service! I was running late today due to my work schedule and traffic so I called and let the staff know. I was several minutes late but I was still seen in a few short minutes. I had some chains placed and Dr. Norris even took his time to file down a sharp edge on one of my teeth. I am so very pleased with the way my teeth are changing. One more month and my braces come off! Thanks Dr. Norris and your staff!" “Dr. Norris has figured out how to make kids LOVE to come to the orthodontist — siblings, too! He pairs top notch orthodontic care with perks like prizes, t-shirts, contests, movie day, video games, and the list goes on. Dr. Norris and his complete staff are always professional and kind, putting patients and their parents at ease. He meets kids at their own level and works with them to customize their plan for comprehensive orthodontic care. With Dr. Norris’ fantastic set-up, imagine my shock when the bill came in at half of what I was paying in Maryland for equivalent care. I have recomended Dr. Norris and his team to many friends." “Wow! Most people wouldn’t consider getting braces an enjoyable process but the staff at Stone Oak have done just that. Right from the beginning I was impressed. I was given multiple financing options. Dr. Norris called me the evening after I first got my braces to see how I was doing and to give me his personal, after-hours number in case of problems. Very above and beyond anything I expected. 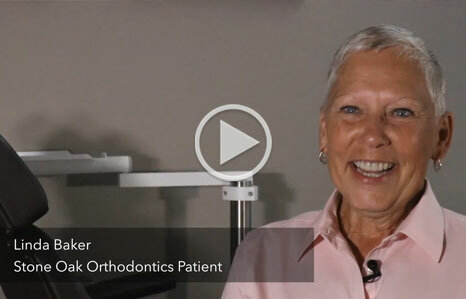 I had opted for the clear braces, but didn’t like them after 6 weeks.Dr. Norris replaced them with traditional braces at no additional cost. WOW! Besides Dr. Norris, I must also mention the rest of the staff, they are all wonderful, professional, friendly and knowledgeable. When you come to the door a sign reads “Enter Smiling,” and they practice what they preach. Upon entering you're greeted with the smile of Julie, Tonya or Cheryl. Marie is usually my provider. I swear, I think her parents gave her dental tools instead of a rattle as a baby. She’s amazing. Plus she’s funny, chatty and genuine. Would I recommend Stone Oak Orthodontics? I wouldn’t recommend you go anywhere else!"